At this point, you should be familiar with the unit circle definition of trigonometric functions. The standard trigonometry function, sin(theta), cos(theta) and tan(theta) are not one-to-one function. They are many-to-one, which means many angles (domain) would give one value of x,y (range). 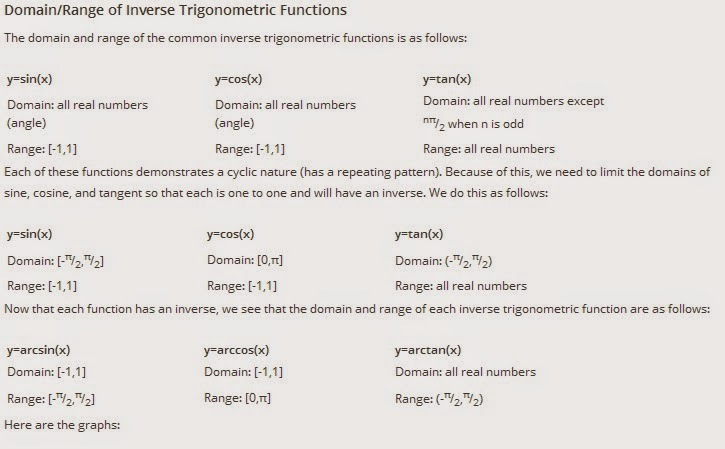 However, there is no inverse because one range value will give rise to many values in the domain. One way to check this is by the horizontal test on the trigonometry function curves (not the unit circle graph). For example, in the inverse sine function, each horizontal line (y) would gives many values of theta. To ensure that inverse sine function can exist, each horizontal line must only give one value of theta. To begin, we restrict the domain of the trigonometry functions.Therefore each y value on the unit circle must only be 'produced' by one theta value. 1) Make sure that rotation about theta + 2pi is not possible. 2) Make sure that rotation by pi/2 that give the same theta is not possible. For an example with the sine function, sin(theta) = y coordinates because sin(theta) = y/1. because sin(3pi/4) is not possible in this domain and each y coordinate only gives 1 theta value.